Dissolve honey in the lime juice. Add rest of the ingredients and 2 cups of ice, and blend for 30 seconds (shake with ice and strain over crushed ice). 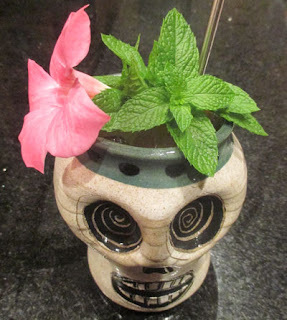 Fill 2 Tiki mugs (1 mug), and garnish with pineapple slices speared to cherries (mint and flowers). Friday two Weeks ago, I turned to Beachbum Berry's Sippin' Safari for my evening's post-shift drink. There, I spotted the Samoan Typhoon created by Chef Joe King Sui of the Hawaiian Village Motel and Restaurant in Tampa, Florida, cerca 1969. With passion fruit syrup and honey as the sweeteners, I was definitely intrigued. Once all mixed and garnished, the Samoan Typhoon shared a mint aroma. On the palate, lime and honey filled the sip along with a vague fruitiness from the pineapple and passion fruit, and the swallow proffered more of the passion fruit in addition to the rum notes.